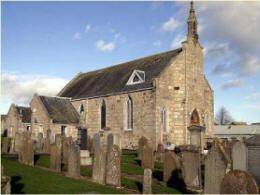 There are records of a church in Kemnay in 1552 (precise details unknown). The building erected in 1632 was on an east-west axis and stood until 1844 when it had to be demolished as, despite constant repairs, it had become unsafe. The ‘new’ building moved to a north-south layout and is the basis of our current church (original cost £266.19s). This building saw changes over the years, including the installation of the Pipe Organ in 1907, and in 1958 the spectacular stained glass ‘north window’. A renovation at the end of 2008 gave us a “door of opportunity” to provide a church for the 21st century with a flexible design enabling all forms of worship to continue. We have a light, bright building offering a warm welcome to congregation and visitors. Further information is available from Booklets available at both the church and church centre.